The HP Spectre x360 has all the makings of a great 2-in-1 machine with a stylish chassis and excellent screen that make it deserving of high marks, but weight issues are a concern. Update: HP has informed us a bios can be installed to fix a number of issues with the track pad and keyboard backlight on the Spectre x360. TechRadar will re-test the laptop and update this review accordingly. If it transforms, it'll probably look ugly. This is basically the precedent that has been set by anything that can change from one form to another from Transformers realized as toys to even real-life amphibious and flying cars. This hasn't been more true than with 2-in-1 laptops, which for the most part have failed to gracefully walk the line between laptop and tablet. The Surface Pro 3, for instance, comes at the hybrid machine problem as a tablet first, which makes it invariably lopsided when paired with the wafer-thin Type Cover. The Asus Transformer Book T300 Chi comes closest to balancing the needs of a thin tablet and sturdy laptop, but at the cost of all its full sized ports. At long last, the HP Spectre x360 might be the first transforming laptop to finally strike the perfect balance. Unlike most other hybrid notebooks, this 13-inch machine looks like any regular, garden variety laptop. But in one quick motion, I can flip the screen back 360 degrees to turn it into a full-on Windows 8.1 tablet. Looks aside, the Spectre x360 is an honest-to-god, 13-inch laptop complete with an Intel Core i5 processor and a flex-free keyboard to boot. HP has finally arranged the ultimate marriage between laptops and tablets to make this premium hybrid – for a reasonable $999 (£899, AU$1,899) price – but I really wish it weren't so dang heavy. If Lenovo and Apple ever got together to make a baby, it would be this. That's not meant as a derogatory comparison either. 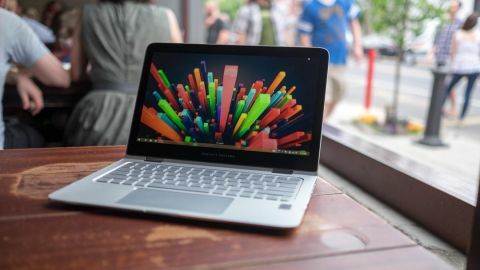 HP has blended the best elements of the MacBook Air's aluminum body with the rotating hinges from Lenovo's Yoga series of convertible machines to make one gorgeous computing device. The outside shell of the Spectre x360 is wholly minimalistic with almost no embellishments on its plain, anodized aluminum chassis. The only things worth noting are the words Hewlett Packard embossed on the right side of the laptop lid. Another logo is also printed on the rear edge of the laptop's base. Additionally there's a thin slit of plastic that runs parallel to the top of the screen, which most likely hides the Wi-Fi radio. Speaking of slits and edges, the Spectre x360 is a marvelously thin device that measures only 0.63-inches thick. It's a pretty piece of kit that almost looks white, thanks to its all-aluminum frame. An extra touch you won't see on any other machine is the Spectre x360's edges have been polished to a mirror sheen. Things get a bit more interesting when you open up the laptop, as you can push the screen back a full 360-degrees, turning this everyday notebook into a Windows tablet. HP has come up with a seamless geared hinge, which allows the laptop screen to smoothly arc up and down. This transforming mechanic might sound very similar any of Lenovo's Yoga hybrids – which have spawned more than a dozen copycat devices – but HP has come up with a design that blends in. Whereas the watchband-inspired strips of metal found on the Lenovo Yoga 3 Pro stick out like a sore thumb, the metal hinges on the Spectre x360 look like they're simply part of the machine. Instead of noticing the hinges, your attention is likely to dart immediately to the unusually wide trackpad. Nearly double the width of a traditional pointing device, the Spectre x360 offers an expansive and smooth surface to glide your fingers over. Aside from the smooth feel of the trackpad, it's accurate to a millimeter, thanks to Microsoft's Precision trackpad software – co-developed with Intel, Synaptics and Elan. Unfortunately, for all the excellent tracking this massive surface offers, it has just as much trouble accurately registering clicks. Almost every time I clicked on an icon, tab or anything on the screen, I have to press the mouse button a second time before anything actually happens. At the same time, because the trackpad stretches beyond the span of the space bar, my palms accidentally press into the oversized button as I type. For anyone annoyed by constantly triggering Windows 8.1's navigation gestures by accident, HP and Microsoft have worked in some excellent palm rejection software. The keyboard follows a more traditional layout and a complementary white backlight to help you see the keys in the dark. Of course, there's the option to turn off the keyboard backlight – but when you do so, the F5 key always remain lit. It's an odd, eye catching quirk I haven't seen on any other machine before, and it can be distracting until you get used to it. The keys themselves feel a bit mushy and don't offer the same crisp typing experience as a 13-inch MacBook Pro. However, the typing experience on the HP 2-in-1 is more than serviceable, and most users won't notice unless they're sticklers for the very best laptop keyboards.